Mr. Harris began by thanking the Society for inviting him to speak about organising the Biddulph Festival but hadn’t realised it could be regarded as history until he saw that the Cuban Missile Crisis was now included on the current History syllabus and that he can remember that. He also wanted to make sure everyone understood that he wasn’t organising the Festival for twenty years on his own but that it was the work of ‘The Famous Five Go To Biddulph’: Eric Cox this year’s retiring Chairman, Wayne “How much” Rogers in charge of finance; Veronica Brown in charge of publicity; and Barry Stanway, playwright and event organiser. All five have had numerous other roles down the years some of which may be outlined in his talk. 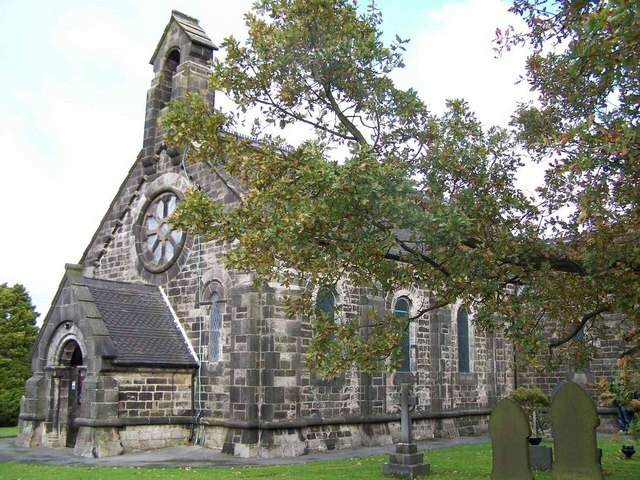 Biddulph has always had a wide range of societies that were run by volunteers including choirs, music groups, history and craft groups for example the Biddulph Players. There had been a well-supported Carnival in the 1970’s but this finished in the 1980’s. In the year after Mr. Harris had been mayor, which had been 365 days of high activity which ended after the Civic Ball in April, he had nothing to do. As a member of the Tourism Sub-committee he was anxious to counter the statement that Biddulph was a “grubby little town in a pleasant valley”. Eric Cox had organised the “Folk in the Park” concerts for about five years. 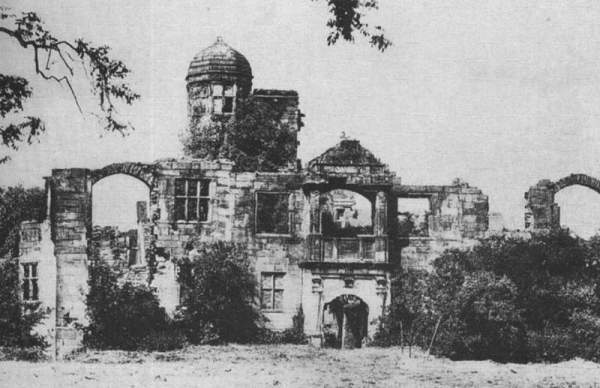 Barry Stanway had arranged for the Sealed Knot Society to re-enact the siege of Biddulph Old Hall at the Country Park and produced a play about the Bateman’s. Not all the idea’s worked, the skateboard competition which followed the building of a half pipe on Station Road attracted only one entry. There were complaints about the noise and other activities at the skate park including a possible peak in the birth rate. 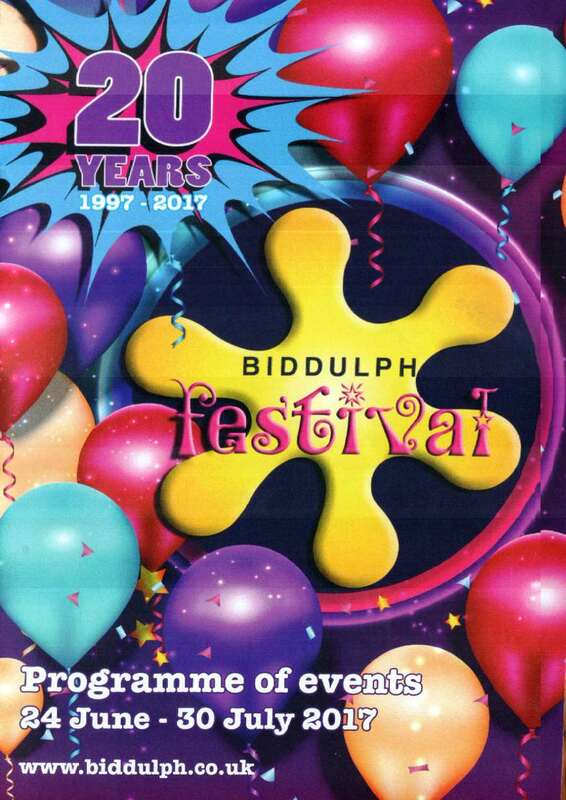 In 1998 the first festival was held with six events and using money made available by Biddulph Town Council and Staffordshire Moorlands Council. One important milestone was a meeting with Sarah Austin who had been organiser for Stoke-on-Trent’s short lived Festival and she gave some excellent advice: to put the Festival on a firm business footing; create a brand logo - the flash of colour still used on the publicity material; and, to have some core events. These were to include ‘Folk in the Park’; ‘Rock on the Rocks’ held on Biddulph Moor with up to forty four bands playing; the ‘Continental Café’ in front of the Town Hall on each Saturday; and ‘Biddulph By the Sea’. The idea for the latter had come from the ‘Paris Plages’ which started in 2002 on the side of the Seine when the riverside became a beach. In Biddulph twenty tons of sand was delivered to Station Road for the children to play in (later outside Sainsbury’s). The Famous Five would often have to go to work with shovels to spread it ready and then return it to the lorry at the end of the day. When the ‘By the Sea’ was cancelled due to inclement weather Mr. Harris was told he had stolen the children’s fun. The completion of the inner relief road allowed parts of the High Street to be closed during the Festival. The Festival grew with thirteen events in 2001; eighteen in 2006; and seventy one in 2013 of which thirty one were free. This year there were over sixty events and the Festival lasted from June and all of July and included as usual the Warwick’s Fun Fair. The highlights for Mr. Harris were many and varied and included both highs and lows. One high was when the Crewe V.C.O Big Band played tunes from the 1940’s in the Town Hall, Biddulph Town Council gives the use of the Hall free of charge to the Festival Committee. Another high was the appearance of Lilia Kopylova and Darren Bennett from ‘Strictly Come Dancing’ one year and Flavia Cacace and Vincent Simone the next. Whilst mentioning dancing he remembered the day when around one hundred and fifty ladies were attending a belly dancing training session. Later there was ‘Biddulph Goes to Bollywood’ when classical Indian dancers performed at the Town Hall with a buffet provided by the Saffron Café. The ‘Continental Market’ provided the lowest low when Mr. Harris found himself standing outside the Town Hall at 5 a.m. wondering if the vehicles of the heavily-publicised French Market would actually turn up. When they did they provided three days of fresh produce including a huge two storey articulated bakery lorry the owner of which was asked “Do you have a bacon butty?” in the early hours of the morning. The year of the Court Writ. Mr. Harris received a summons for the non-payment of a bill for fireworks from the Northampton County Court. It was after a spectacular failure of some fireworks at the front of the Town Hall. The fireworks expert who sold them claimed there would be a wall of flame but what ensued was a spluttering of roman candles up to the dizzing height of eighteen inches. If you should ask Mr. Harris to speak to your group he will explain the whole story as there isn’t room in this report. At the time of the 2010 Rugby World Cup in South Africa the ‘Mighty Zulu Nation Theatre Company’ was invited to perform in St. Lawrence’s Church. The agent said this wouldn’t be a problem as all six were Catholics but later rang to say they couldn’t attend. He informed Mr. Harris that a ‘Gang Boss’ was searching for one of the members of the group and they were in hiding. When Mr. Harris passed this information to the ‘Chronicle’ the agent contacted him with the real reason – the Zulu’s were double booked and appearing in Leeds. The Festival is organised by the Committee who have about five meetings a year perhaps the most important being the final panic meeting. One major role is the avoidance of clashes – if the Biddulph and District Youth Orchestra are meant to perform at the same time as ‘Rock on the Rocks’ the Orchestra will probably be short of members. 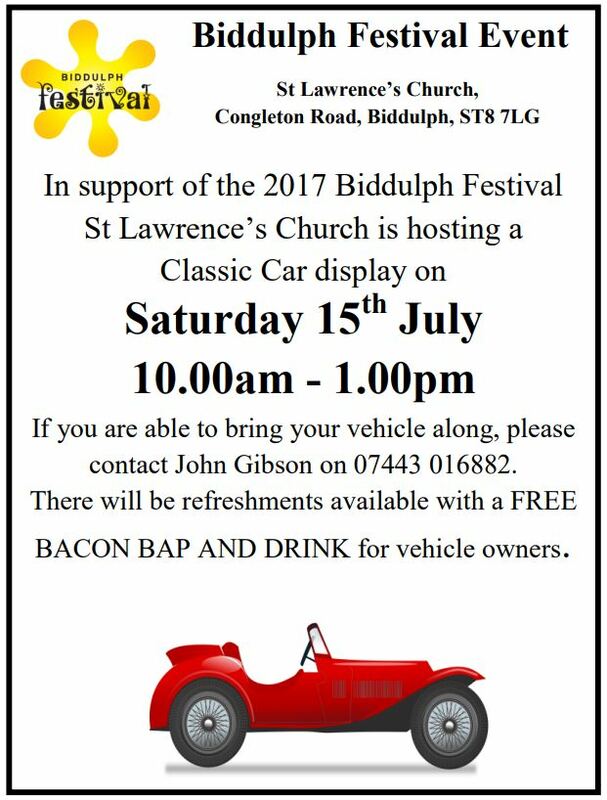 The committee also produces the leaflets and in 2017 there were twenty thousand, with seven and a half thousand delivered with the Biddulph Times. In twenty years the Festival hasn’t run at a loss and it has been estimated that as well as money raised for charities it has led to the spending in Biddulph to increase by £100,000. Finally, the Sainsbury’s Children’s Buffet have to be organised with tables and chairs outside the store and the supermarket giving the plated food. Poster on the left: One of the 2017 events. As Mr. Harris and Mr. Cox have now stood down and passed the baton to the next generation then the BDGHS Society can only say ”Thank you“ and wish them all the best in the future. Mr. Machin thanked Mr Harris for a thoroughly engaging and informative talk. He thanked Mr. Cox, Mr. Rogers, and Mr. Stanway for attending the meeting and all five (unfortunately Veronica Brown was unable to attend) for putting Biddulph on the map by organising such a successful Festival. A short question and answer session followed the talk with further lively discussion that continued over coffee and mince pies. 1. There will be a Book Sale on Saturday the 20th of January 2018 between 10 a.m. and 2 p.m. in Biddulph Library. The latest book Transaction, No. 12 ‘Ada - Love At Jerusalem,’ research by Christine Jesson with references to Biddulph and Knypersley (40 A4 pages at £4.00) and Derek Wheelhouse’s books “Images of England - Biddulph Volumes 1 and 2“ will be on sale at £6 each or both books for £10. The November meeting of the Biddulph and District Genealogy and Historical Society was held at 7 p.m. on the 20th in Biddulph Library. Roland Machin, the Society’s Chairman, introduced Mr. Bill Ridgway who gave a talk entitled “A History of Christ Church Biddulph Moor.”. Mr. Ridgway’s talk was wide ranging in its coverage of the building of a Church at Biddulph Moor at the instigation of James Bateman, with a liberal helping of anecdotes and asides. This report covers just a part of a spell-binding performance which lasted for a good hour and covered both the building of the Church, and its predecessor the school, and the effect they had on what in the 1850’s was a very poor district. An area of small-holdings called “wheelbarrow farms,” where the scratching of a living from the land was a hard life for all. Many of the people were recorded in the census as miners but this would probably be the mining of local coal in local bell pits. At this time the area was very isolated without good road access, the nearest turnpike being in the more prosperous Biddulph Valley. It was also on the boundary of two large parishes those of Biddulph and Horton. The Methodist Church was building chapels on the moor and could also hold a meeting in local houses or the open air. 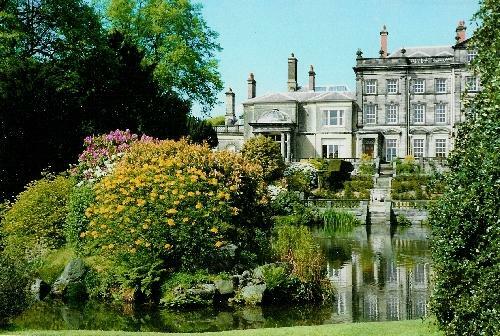 James Bateman moved into Biddulph Grange in 1840 and coming from a strong Church of England background he had already built a Church at Knypersley, St. Johns, in 1849. There was also a school at Knypersley Red Cross from 1850. With St. Lawrence’s Church meeting the needs of Bradley Green the people of the Moor where without a school or Church. The 1850’s saw the Crimean War (1853-1845; Dicken’s novel “Bleak House” (1853); the Biddulph Valley Railway Line in 1859; and, the publication of Darwin’s “Origin of the Species” (1859). The new railway allowed Mr. Bateman to travel to London via Congleton in just over seven hours. Here he attended the talk on Darwin’s theories on the 30th of June 1860 and he was present at the debate at Oxford between Samuel Wilberforce (son of the slave trade abolitionist who strongly believed in the Book of Genesis) and the atheist Thomas Huxley. James Bateman tried to reconcile his strong religious beliefs with the new science by attempting to marry the two ideas – hence the geological corridor at the Grange. 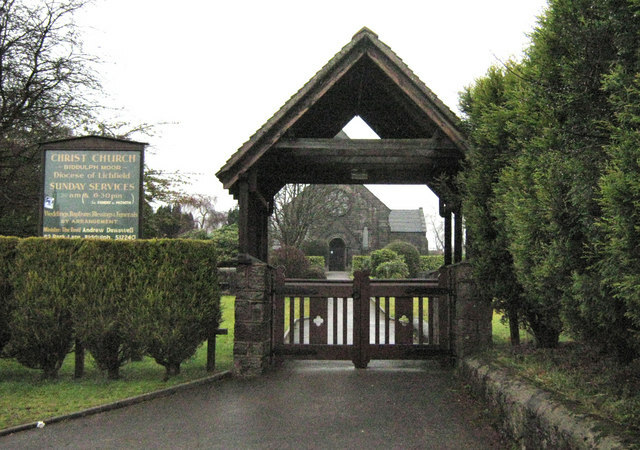 Photograph Left: Christ Church, Biddulph Moor from the West Gate. On Biddulph Moor as the Methodist Chapel was built in 1852 Bateman decided that a school should be the first step in bringing people on the Moor to the true Church. One of James Bateman’s fears was that people on interpreting Darwin’s work would become atheist. The National school was run for pupils during the week and opened on Sunday’s for worship. The building which is now Christ Church Hall was later extended by Robert Heath (in 1885) but the original front two rooms were for the school and the larger room to the right, when looking from the later Church was intended for worship. His collaborator in the Grange Gardens Edward W. Cooke was involved in the designing of a Church which was initially be a very Italianate structure, however, the realities of the cost of such a building these plans were scaled down. A committee was formed, with the ever energetic Bateman as its Chairman. At a meeting held on the 5th of June 1860 a decision to put the plans out to tender was made with a commitment to raise funds by the Chair. Funds were available from the Church of England but they were only committed to a new Church when there was evidence of a majority funds locally. The tenders went out and thirteen builders applied with building costs ranging from £875 – 1,300. A tender from Joe Stanway was accepted and the contract was signed in March 1862. The land was part of the Mainwaring estate and the rock was quarried from Bailey’s Hill. The architects had specified most of the requirements including two sources for Lime, including Froghall and a second source for the plastering; the heating system from Longton, etc. The contract included two penalty clauses which would have cost Mr. Stanway dearly – the first applied if the building was not covered by March 1962 and/or not completed by April 1863. Fortunately it was an unusually mild winter on Biddulph Moor that year and the building was completed on time. However it must have been a close call as the coal for the heating wasn’t delivered until two days before the date in May when the building was consecrated. Photograph Right: Christ Church, Biddulph Moor. Whilst Mr. Stanway was busy undertaking the work the supervisor wasn’t Mr. Bateman who continued with his travels to London for the opera but Hugh Francis Gordon the rector. As there were not parish tithes with which to pay Mr. Gordon then Bateman kept making him an allowance – sometimes the income fromont of the Estate farms. Admittedly Mr. Bateman had secured money for the building from Hugh Henshall William, Mrs. Stonier, Mr. Egerton-Warburton, etc. he hadn’t arranged for changes to the parish boundaries of Biddulph and Horton to give Mr. Gordon his own income from tithes. This didn’t happen until 1864 when a parish boundary bordered on the East by the Top Road was agreed. The parsonage for Mr. Gordon, initially temporary, was probably paid for by the sale of some of James Bateman’s famous collection of orchids. The Church was completed in the year Biddulph Old Hall was excavated; the London Metropolitan line went into service; the rules for football were agreed; and a year before the completion of Mr. Brunel’s Clifton Suspension bridge in Bristol. Mr. Bateman was to continue to live at the Grange for another 6 years before moving to Worthing in reduced circumstances, the whole estate being sold to Robert Heath in 1871. The final part of Mr. Ridgway’s talk concerned some research made at the Church when he was writing his book “A Church for the Moor”. The Church has had a number of vicars who fortunately placed all the Church records in cupboards and drawers rather than getting rid of them. These provided interesting reading and the graphs and facts which follow. 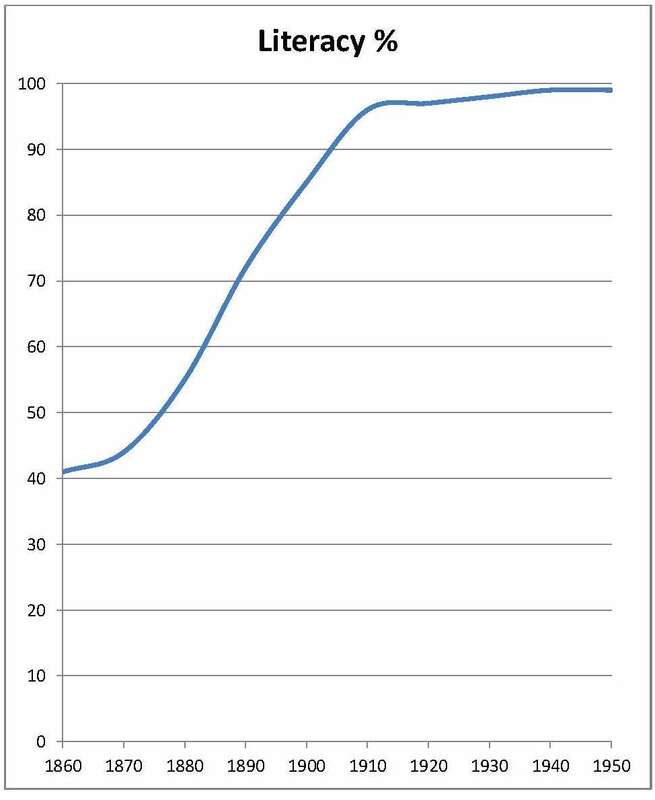 Chart Right: Literacy level after the School opens on Biddulph Moor. By checking the number of parishioners who signed their name, instead of just making a mark “X” on the registers, rose from around 40% when the school opened and reached more than 95% by the 1910’s. 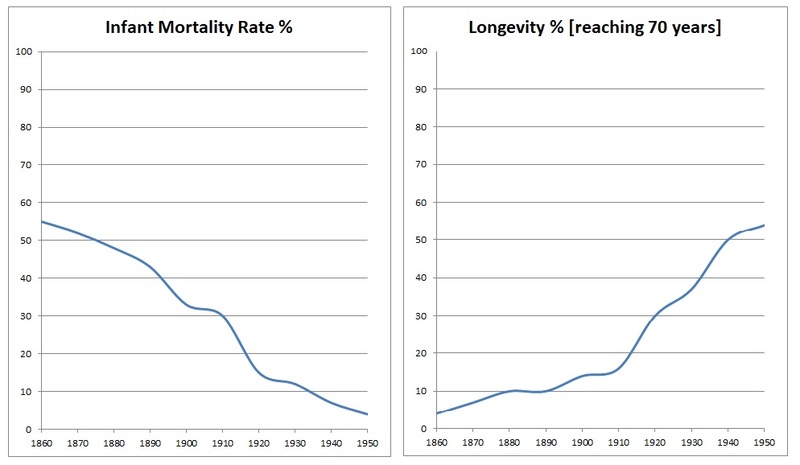 Two other graphs, of the many given in Mr. Ridgway's handout, were the infant mortality rate and the changes in longevity between 1860 and 1950. A number of questions were taken before Mr. Machin thanked Mr. Ridgway for an illuminating tour de force on Christ Church which he completed without recourse to notes. The meeting broke into small groups for further discussion whilst taking tea and biscuits. Notices: There will be a Book Launch and Sale on the 16th of December 2017 between 10 a.m. and 2 p.m. in Biddulph Library. The new book is a new Transactions, No. 12, ‘Ada - Love At Jerusalem,’ research by Christine Jesson into the book written by Henry Francis Gordon and published in 1895 with references to Biddulph and Knypersley (40 A4 pages at £4.00). The original book was found in the collection of the late Mr. Harry Page. Also on sale will be Derek Wheelhouse’s books of photographs, Images of England - Biddulph Volumes 1 and 2 will be at the new low price of £6 each or both books for £10. They will make an ideal Christmas present for the old and new, the present and former residents of Biddulph. The October meeting of the Biddulph and District Genealogy and Historical Society was held at 7 p.m. on the 16th of October in Biddulph Library. Roland Machin, the Society’s Chairman, introduced Mr. Levison Wood (Senior) whose talk was entitled “Dear Duchess - the life, loves and tragedies of North Staffordshire’s own Millicent Sutherland”. The following report of the meeting only gives a skeletal view of a wide ranging and informative talk about some of the richest families in England and Scotland and their relationship to the Monarchy and the Government of the Country. Millicent was the eldest daughter of Robert St Clair-Erskine, 4th Earl of Rosslyn, and Blanche Adeliza Fitzroy, the widow of the Hon. Charles Maynard, born on the 20th of October 1867 at Dysart House in Fife. Her brother James Francis, later the 5th Earl, was born in 1869; Alexander in 1870; Sybil Mary in 1871 who married the 13th Earl of Westmoreland; and Angela Selina in 1876. Her half-sisters were Francis Evelyn who married the 5th Earl of Warwick and Blanche who married Algenon Lennox. Robert, 4th Earl of Rosslyn owned the mineral rights and fishing port of Dysart with an income of £17,000 per annum in 1890 which financed a London house with a noted collection of paintings, membership of the Conservative party, a passion for food and women. 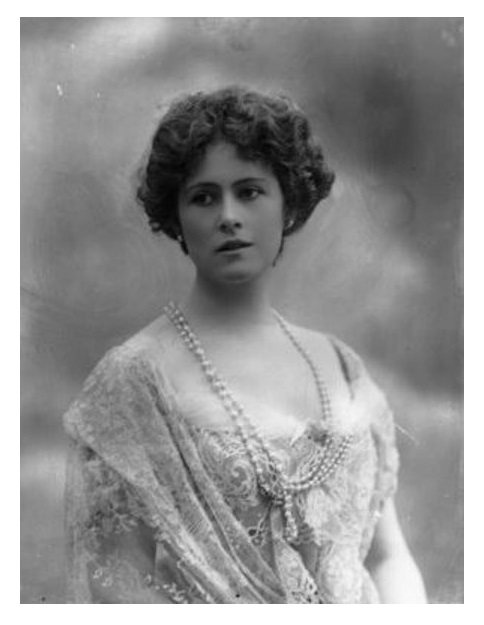 Photograph: Millicent, Fourth Duchess of Sutherland - one of many society photographs. These bare facts hide a number of stories: half-sister Francis Evelyn, known as ‘Daisy’ was rumoured to be marrying Prince Leopold, but then married the Earl of Warwick but preferred Charles Berrisford of a social set that included Albert Edward, Prince of Wales, who later became King Edward VII to whom she was a long-term confidant and/or possible mistress. Millicent’s brother James Francis, known as ‘Harry’, was to spend up to seven and half million pounds of the family fortune. In one incident whilst his wife was in labour with their first child he decided to travel to York races to watch one of his horses and didn’t shirk from hiring a private train to travel home to Fife at five shillings per mile. Angelina, Millicent’s youngest sister was to be the first woman to travel down the Cresta Run and take a hot air balloon trip. However, the family also had a ‘socialist’ tradition, Daisy supporting many schemes to aid the less well off in education, housing, employment and pay for example, she established colleges for the education of women in agriculture and market gardening. When Millicent was fifteen she travelled to the home of the 3rd Duke of Sutherland at Dunrobin Castle some fifty miles north of Inverness. She was accompanying her half-sister Blanche who was to be introduced to Cromatrie the Duke’s son. The Leveson-Gower’s where one of the richest families in Europe, the Leveson’s of Wolverhampton and Gower’s of Stittenham in Yorkshire had made fortunes from a joint interest in wool. They were families who benefitted by buying the land and sheep from Thomas Cromwell when the Monasteries which were dissolved by Henry the VIII. Later they increased their prestige and money from conscripting troops in Wolverhampton and Stafford to repulse the incursion of Bonnie Prince Charlie in 1745. The family of Leveson-Gower inherited the title Duke of Sutherland when William’s son, Granville married Elizabeth, Countess of Sutherland, in 1785. They were also involved in the Highland clearances when the people got in the way of the grazing of sheep. Lady Millicent St. Clair-Erskine married Cromartie Sutherland-Leveson-Gower, Marquess of Stafford, eldest son and heir of the 3rd Duke of Sutherland, on her 17th birthday the 20 October 1884 at St. Paul’s Church Knightsbridge. He inherited the Dukedom of Sutherland on his father’s death in 1892 and died in 1913. 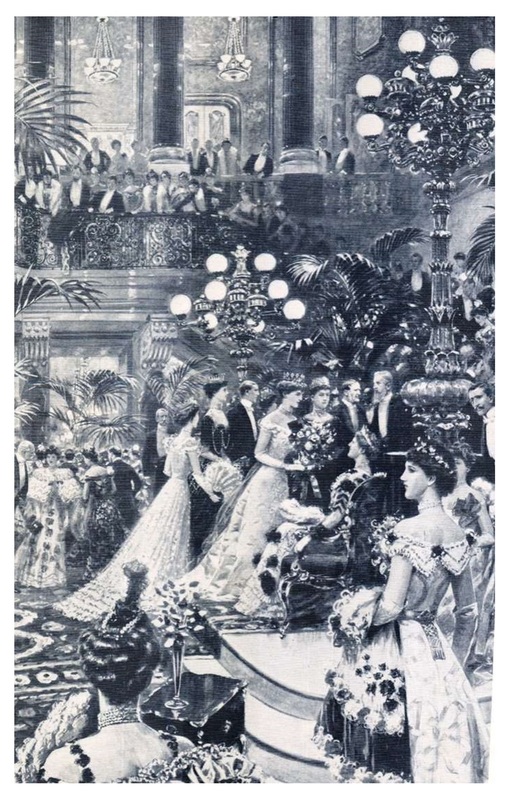 They had four children, Lady Victoria Elizabeth (1885) who sadly died when she was three years old, George Granville (1888) who was to be the 5th Duke of Sutherland, Alastair St. Clair (1890) who married Elizabeth Demarest whose daughter Elizabeth Millicent was the 24th Countess of Sutherland, and Lady Rosemary Millicent (1893) who married William Ward, the 3rd Earl of Dudley. The family had homes in Scotland, Staffordshire and London. Millicent became a great society hostess at their London home, Stafford House and developed a reputation as an advocate for social reform, although to a lesser extent than her half-sister ‘Daisy’. Although this was when the name ‘Meddlesome’ was applied her campaign to remove lead paint glazes from Staffordshire pottery was successful. Other projects were the Newcastle Cripples Guild and Guild of Handicrafts to provide employment; the products of the latter Guild are now highly sort after and collectable. Cromartie allowed his wife a great deal of freedom to do as she wished but had one rule – that she would not disagree or rebuke him in public. He concentrated on his properties and made many changes to Dunrobin, Trentham and his London home. Before the outbreak of the first World War there are many changes and upheavals in the lives of both Cromartie and Millicent but in August 1914, she organised an ambulance unit that saw active service in the siege of Namur, Belgium. Trapped behind enemy lines in Belgium, she escaped to England. She married Major (later Brig. Gen.) Percy Desmond Fitzgerald, 11th Hussars in October 1914, at which time she became known as Lady Millicent Fitzgerald. She returned to the continent in October to direct field hospitals in northern France. She moved with her unit to Roubaix in June 1918. For her war service, she was awarded the French Croix de guerre, the Belgian Royal Red Cross, and the British Red Cross medal. She was divorced from her second husband in 1919, on the grounds of his infidelity. 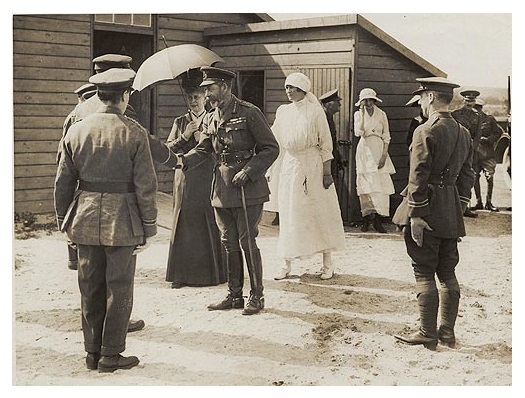 Photograph: King George V and Queen Mary inspecting Millicent, Fourth Duchess of Sutherland’s, hospital at Calais during World War I. In October 1919 Millicent married for a third time to Lieutenant Colonel George Hawes. The marriage was unhappy due to her husband’s homosexuality, and they divorced in 1925. She lived mostly in France through the 1920s and 1930s, and also travelled. She was living near Angers in 1940, and was captured after the German occupation of France. She escaped via Spain and Portugal to the United States, and returned to Paris in 1945. Millicent died on the 20th of August 1955 in south-west France, she was cremated at Père Lachaise cemetery in Paris, and her ashes were interred at the Sutherland private cemetery at Dunrobin Castle. If you would like to read more about Millicent, a lady who Mr. Levison Wood obviously admires, then Denis Stuart’s 1982 book “Dear Duchess – Millicent Duchess of Sutherland 1867 -1955” is recommended reading. An interesting question and answer session followed and the meeting broke for tea and biscuits and further discussion of this beautiful and remarkable lady. Notices: There will be a Book Launch and Sale on the 11th of November 2017 between 10 a.m. and 2 p.m in Biddulph Library. The new book is an updated version of Mr. Michael Turnock's book “Always Doing His Duty” the story of John Harold Rhodes VC DCM and bar - the Packmoor Hero at £3.00. The first meeting of the new season of talks of the Biddulph and District Genealogy and Historical Society was held at 7 p.m. on the 18th of September in Biddulph Library. Mr. Mike Salt an artist originally from Biddulph presented a talk about growing up in Biddulph; his training as an artist; and, becoming a professional portrait and landscape artist. Roland Machin, the Society’s Chairman, went through the notices and then introduced Mr. Salt and for the next hour the meeting watched a series of paintings which represented only a small part of the artist’s work. Each section of the talk was illustrated with paintings and portraits. 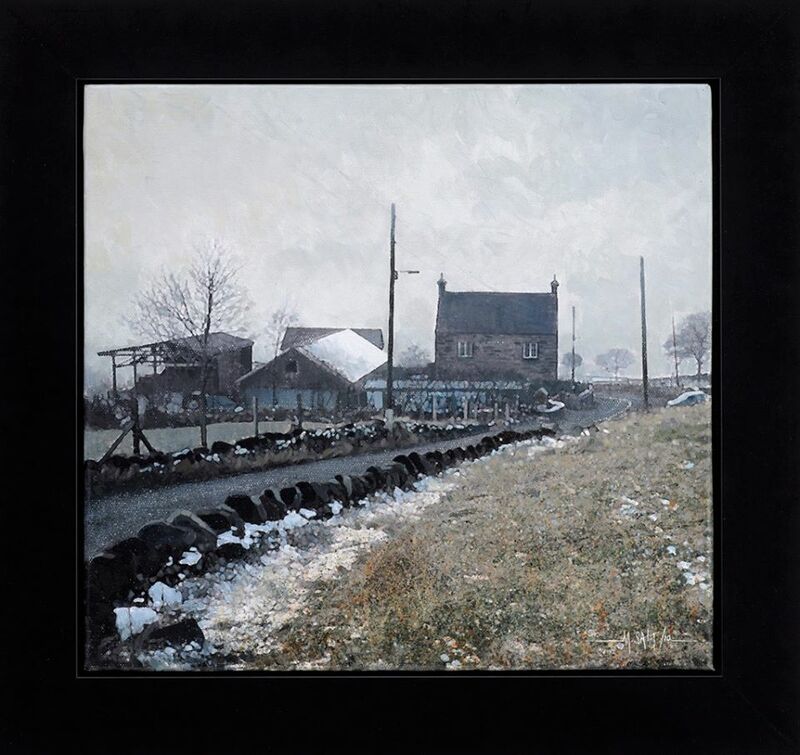 Mr. Salt had started school in Biddulph and enjoyed painting the people, buildings and scenery around Biddulph. This was recorded in his notebooks and then worked up to a final painting. 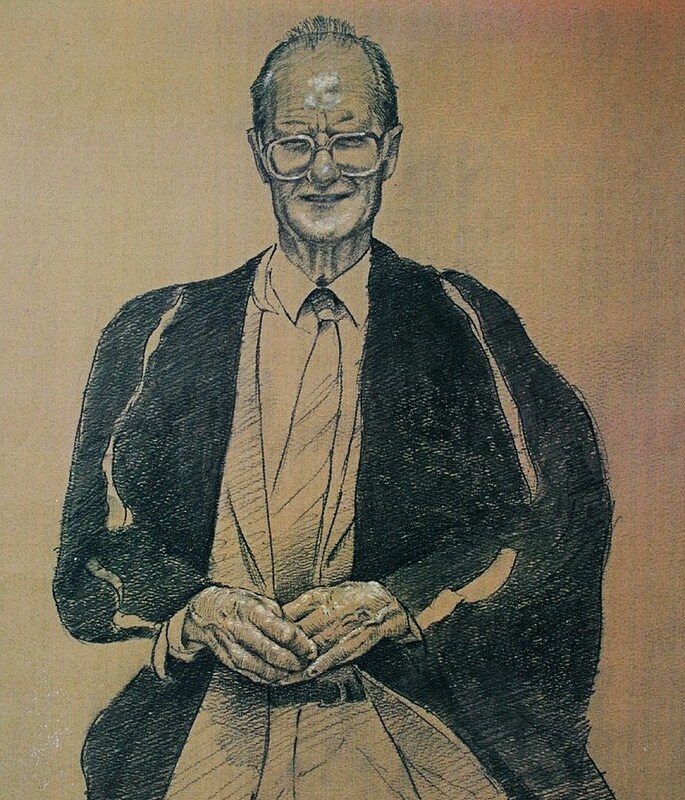 Here is a drawing of his school headmaster which a number of the audience members recognised. He worked in many mediums and the picture below is a water colour of Biddulph Grange. After school Mr. Salt went for a year to Leek School of Art and continued to paint particularly enjoying the life drawing room with its many windows and the design of the gates of the Greystones’ building next door. For the son of a Biddulph miner the next step would be unusual as Mr. Salt applied for a University place at Birmingham. In deciding between fine arts and graphic design the choice was difficult and the possibilities of making a living drawing and painting persuaded him to go for graphic design. During his University years the notebooks continued to be filled with pictures of Biddulph, Millstone grit (pink before it weathers black) walls, and anything he came across as he walked to Knypersley Pool – lorries, tractors, hay stacks, cows, sheep, etc. 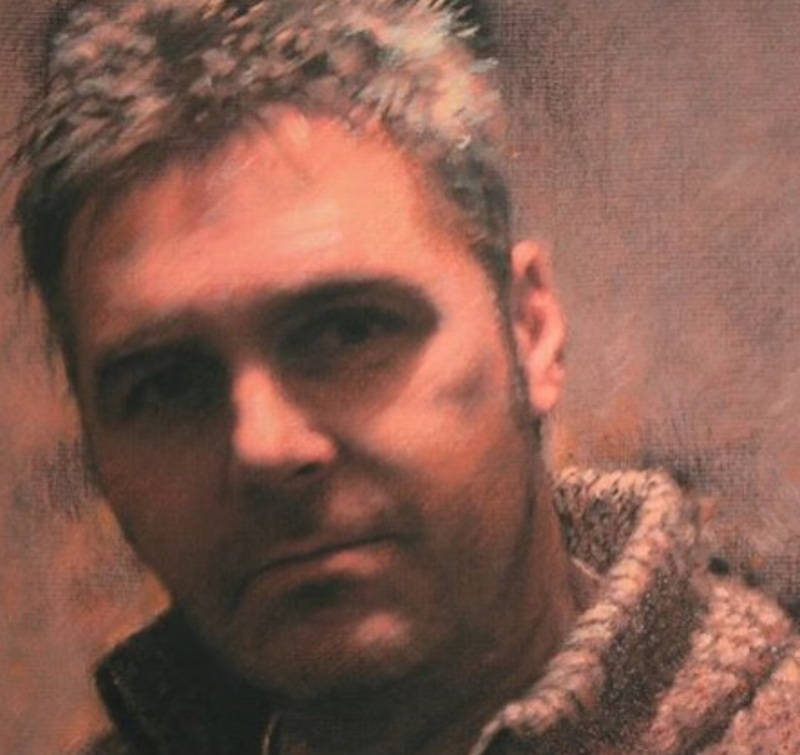 He would sketch his parents, the family dog, his Dad’s Lambretta, holidays at Blackpool and always enjoyed painting farmhouses – including Wickenstone. 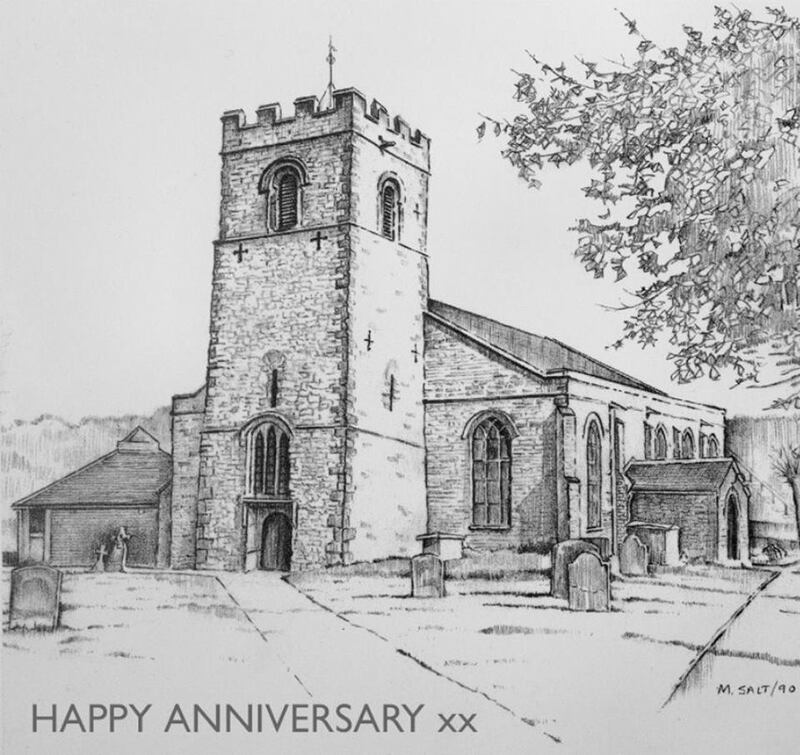 Mr. Salt worked on commission for the Nationwide Building Society doing a long series of drawings for their location services; did book illustrations (but not of his early passion for Marvel Comics) and even a Christmas card [Help the Aged in the 1990’s – right]. He was also lucky enough to be offered some work painting in Florence and worked for the Black Cat Design Studio when he did a series of small paintings that looked like woodcuts. 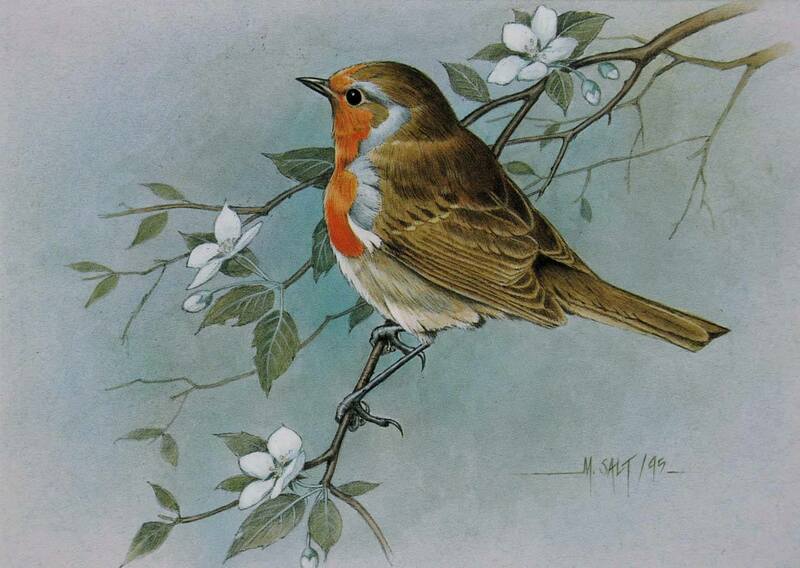 He looked for commissions which included wild life and had to admit that he found most animals and birds easier to paint than people and horses. Even easier were the tree stumps and field walls which were plentiful in Staffordshire. When he got married at Weedon Church, Northamptonshire (see above sketch used as an anniversary card) he set up home in that county and the flat landscape and lack of rolling hills, rocks and drystone walls has changed his landscape painting theme to one of catching the sunlight as it filters through the leaves of trees. With three sons to support through College and University Mr Salt has embraced commissions of people and pets. An extremely interesting question and answer session followed and Mr. Salt answered a number of questions about working as a professional artist. These included the difficulty of fitting painting in with a busy life; the costs of using art galleries; the cost of submitting work to the Royal Academy; and, his increasing use of the Internet to seek commissions. 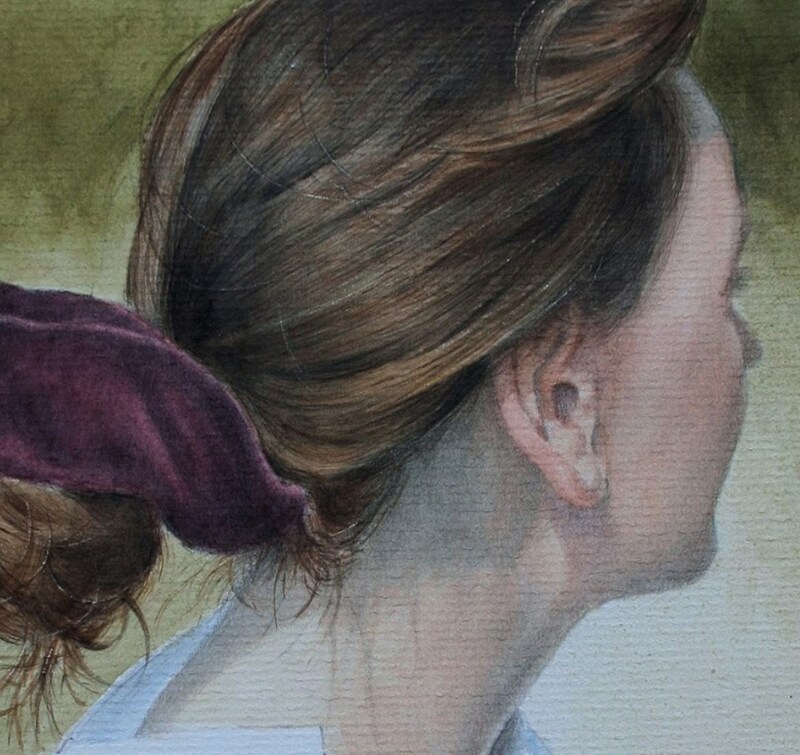 If you would like to see more of Mr Salt’s work then you can find his work on his Facebook page, at ArtGallery.co.uk and eventually his own site onecreate.co.uk. If you would like to discuss a commission you can contact him on msalt@onecreate.co.uk. Mr. Machin thanked him for an excellent comprehensive look at the pleasures and problems of a career as a painter. Notice 1: There will be a book launch and sale on Saturday the 7th of October in Biddulph Library between 10 a.m. and 2 p.m. when Phillip Wheeler’s book on “Peter Biddulph” will be on sale with “Duke of York Square” by Michael Turnock, published to coincide with this year’s walk and “St Lawrence Parish Church, Biddulph - Parish Register of Baptisms, Marriages and Burials 1813-1836”. Notice 2: The Border History Fair will be held in Betley Village Hall on Saturday 14th October, 2017 between 10am - 3pm. Admission is free. Finally, the next meeting of the Society will be on the 16th of June 2017 at 7 p.m. in Biddulph Library when the Speaker will be Mr. Levison Wood (Senior) with a talk entitled ”Dear Duchess“ (the life, loves and tragedies of North Staffordshire’s own Millicent Sutherland). Thanks to everyone who joined the “stroll“ on the evening of Monday the 26th of June around Biddulph. A special thanks to the members of the Society who described some of the history; Mrs. Elaine Heathcote on the High Street from Top to Toe to Albert Square; Mr. Michael Turnock on the War Memorial, Duke of York Square and the mills to Gillow Brook; and Mr Roland Machin on the railway station, coal wharves and Bradley Green Colliery. Some photographs of the speakers on the walk can be found here. The next meeting will be on Monday the 18th of September 2016 the Speaker will be Mr. Michael Salt who will present a talk called “An Artist from Biddulph.” As this will be the first meeting of the new 2016/2017 season the committee of the Society wish all the members and guests who attended this season’s talks a pleasant and relaxing summer break. Sarah Haydon explained that the talk would be in three sections; the first a look at the “Biddulph Grange Country Park - Heritage Lottery Fund” bid; the second to be led by Sue a look at the “Neighbourhood Plan” development; and, the third when Sarah would return to take a look at the “Heritage Projects” within the town. 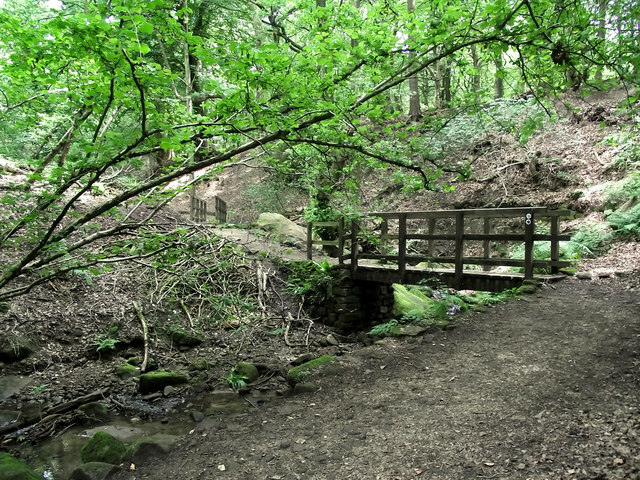 Photograph: Bridges in the Biddulph Grange Country Park. Sarah explained that the bid is supported by a partnership of local groups including the Staffordshire Moorlands District Council, Biddulph Town Council, the National Trust and anglers, walkers and local residents. The aim of the bid is to provide funds to increase community involvement in the park with the formation of a “Friends Group” who will receive training to help in the management of the park, through surveys and practical work such as footpath improvements, dry stone walling, hedge laying, making bird/bat boxes and to survey and monitor wildlife. Developing a historic trail around the park. On-site interpretation boards, covering the history and other details about the lake and how this connects to the hill stream, mill leat and hydro-electric generator that powered the old sawmill. Employ an interpretation consultant to work with local people piecing together the fascinating history of Biddulph Grange. This information will be made available through a variety of media. Develop activities to engage families, such as interpretive geo-caching, activity packs, events and natural areas for children to play. Walks and activities to highlight the history from Bateman, the plantsman, and earlier when it was working woodland and about the wildlife found here. There has already been some positive feedback from the Project Enquiry and the Group supporting the bid are working with a part-time Officer to apply for a three-year project at the end of summer 2017 when a very competitive eight week decision-making process begins. Sarah explained that people can still get involved by joining the Working Group or the ‘Friends Of’ Group and sought the History Society’s support for the bid. The “Preserving our Heritage, Culture & Tourism Working Group” which is attempting to identify all local heritage structures or monuments, understanding their history, our culture and encouraging tourism responsibly. The “Promoting the Local Economy Working Group” which aims to promote the local economy, aiming for prosperity for all. The “Community & Well-being Working Group” who hold the wellbeing of our community at its core. The “Housing Need & Design Working Group” which aims to understand our housing need and encouraging creative and thoughtful design. The “Natural Environment Working Group” caring for our environment, countryside and green spaces ensuring that habitats and wildlife thrive. The third section of the talk was led by Sarah who outlined the heritage projects which the Civic Committee within Biddulph Town Council has made a commitment to restoring and improving. She stated that there had been a lot of discussion about which ones, including a call for ideas in the Biddulph Chronicle. 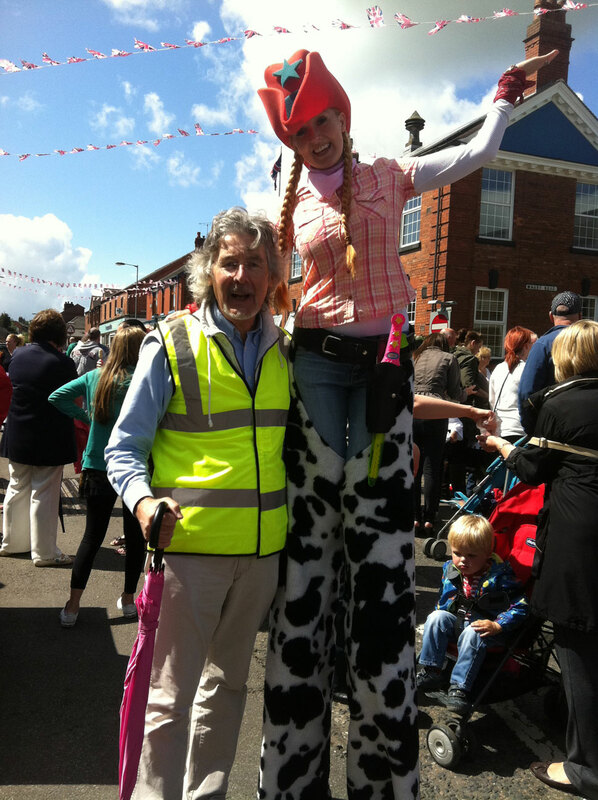 With a small budget a start has been made and the Town Council are also seeking grants to support this work. So far the A527 Kissing Gates and ironwork next to the dye works on Congleton Road and the bridge over Bosley Brook have been completed. Funding has been received for the Overton Road Troughs (see below). Grant applications have been submitted for the well on Tower Hill Road and work on the platform and some signage at Smokies Way Station. For the future, Sarah outlined a possible restoration of the Trent Head Well and the abraded milestones. In the 2017/18 financial year the development of a Biddulph Trail, consideration of a Biddulph museum, an improvement of tourism in the town centre and the installation of finger posts around the town to identify the key locations are being considered. The May meeting of the Biddulph and District Genealogy and Historical Society was held at 7 p.m. on the 15th in Biddulph Library when Mr. Tony Bonson presented a talk entitled “The History of the Macclesfield Canal”. Mr. Roland Machin, the Society’s Chairman, introduced Mr. Bonson and for the next hour and a half the meeting listened attentively to a comprehensive history of the canal; took a journey from Marple to Hall Green; and then heard about the formation and work of the Macclesfield Canal Society. As the talk gave the audience enough information to fill a book this report is a precis of the evening with additional information on one character and one mill that Mr. Bonson included in his talk. 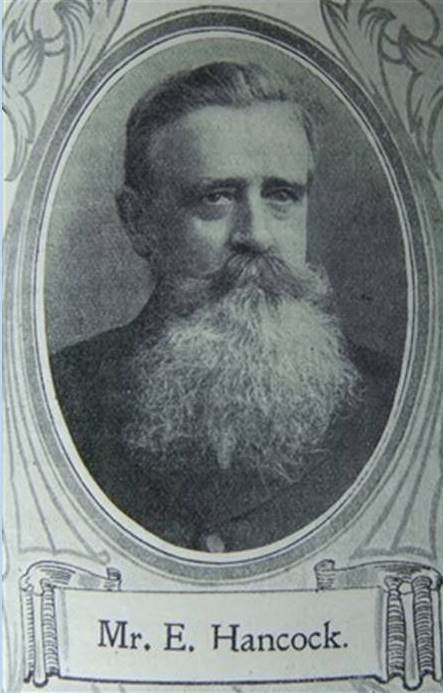 First, we have William Crossley a canal and railway engineer and later some history of Hovis. William Crosley was a canal engineer who became one of Robert Stephenson’s assistants on the construction of the London & Birmingham Railway. In 1802 he succeeded Thomas Townshend as Resident Engineer on the Rochdale Canal. In 1809 he was appointed Engineer to the Brecknock & Abergavenny Canal. In 1811 he was employed on the Worcester & Birmingham Canal in charge of building the forty-one locks at Tardebigge. For the next two years he worked as a surveyor, working mostly for John Rennie. In August 1815 he was at Falkirk, one of several eminent surveyors working on alternative lines for a railway from Edinburgh to Glasgow. In 1917 he was superintendent of the Hincaster to Kendal section of the Lancaster Canal. He completed the northern end of the main line in 1819 and from 1820 he was Superintendent of the whole canal and in that capacity he constructed the Glasson Dock branch. Photograph: One of the Locks at Bosley Built by William Crossley. In 1826 Crosley became more closely associated with Thomas Telford who, with Thomas Brown, had successfully steered the Act for the Macclesfield Canal through Parliament. Telford remained as consulting engineer and appears to have provided some of the designs, for example, the cast iron aqueduct at Congleton which was clearly the forerunner of the one at Nantwich. Crosley was appointed Engineer to the Committee of Management and bore the brunt of supervision of construction. By this late stage in the canal era competent contractors were available, able to commit adequate resources on lengths of three or four miles, and the Canal was open by 1831. One of these contractors was William Seed, who had worked with Crosley on the Brecknock & Abergavenny and Lancaster canals: another was William Soars, who would work for him again with less success on the London & Birmingham Railway. Crosley left the canal for the railway in June 1833 and was responsible, as one of four Assistant Engineers reporting directly to Robert Stephenson, for the Tring to Wolverton section. The principal work in Crosley’s section was the Tring Cutting, where about one and half million cu. yd. of chalk were removed; its maximum depth was 60 ft. Crosley’s salary in 1837 had increased to £700 p.a. and he was still employed in April 1838 when his section opened, but left later in the year as the Company restructured its operations. Crosley died at some time before 1850 but the exact date has not been ascertained. The Macclesfield Canal was one of the last narrow canals to be built indeed it was very nearly built as a railway. There had been a dozen proposed canals aimed at linking the coal mines and the mills around Bollington but one of the reasons they were not built was the Duke of Bridgwater’s opposition. A variety of ideas were proposed and the present canal was approved by Act of Parliament in April 1826 and was completed on the 9th November 1831 at a cost of £320,000. As with many canals, the Macclesfield passed into the hands of the railways for about 100 years. The canal was bought out by the Manchester, Sheffield & Lincoln Railway in 1847. It was managed with the Ashton and Peak Forest canals, which were owned by the same company, and known collectively as the APM Canals. When the canals and the railways were nationalised in 1947, the Macclesfield was transferred to a new body, the Docks & Inland Waterways Board. Commercial carrying finished only in the 1960’s shortly before British Waterways was formed. Although in need of maintenance, the canal remained navigable throughout and did not require restoration when leisure use began. Indeed, the UK’s very first narrow canal cruising club, the North Cheshire Cruising Club (NCCC), was established in 1943 and they and the Inland Waterways Association helped to ensure that it was not abandoned. Mr. Bonson then presented an illustrated tour of the route which takes the canal from Marple Junction with the Peak Forest Canal in the north twenty six and a quarter miles to the stop lock at Hall Green passing High Lane, Higher Poynton, Bollington, Macclesfield, Congleton and Kidsgrove. The last one and a half miles to Harding’s Wood Junction were built by the Trent & Mersey Canal [T&MC] and a Hall Green there were two stop locks and two lock keeper’s cottages, one for each canal. 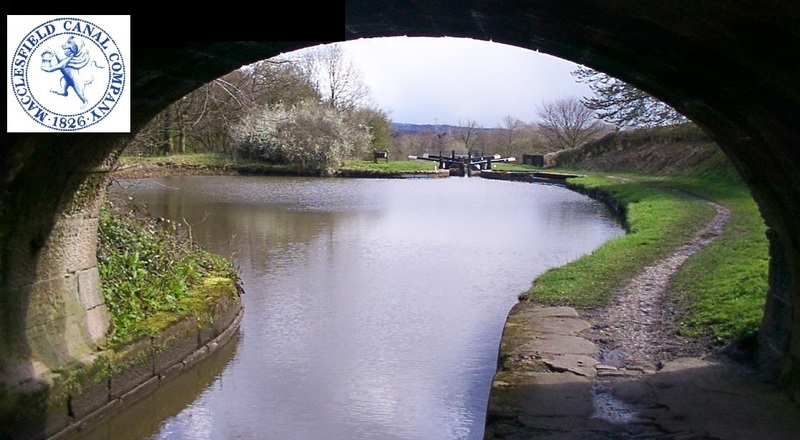 The canal is maintained at two levels divided by 12 substantial stone locks in one and a quarter miles at Bosley which lower the level by 118 feet. The top level is, at 518 feet above sea level, one of the highest navigable levels in the country. Bosley locks are characterised by the unique use on a narrow canal of double gates top and bottom and has side pounds which were used to save water. Two reservoirs, Sutton and Bosley, supply the summit pound with water. Both have extensive feeder systems stretching back into the hills above the canal. 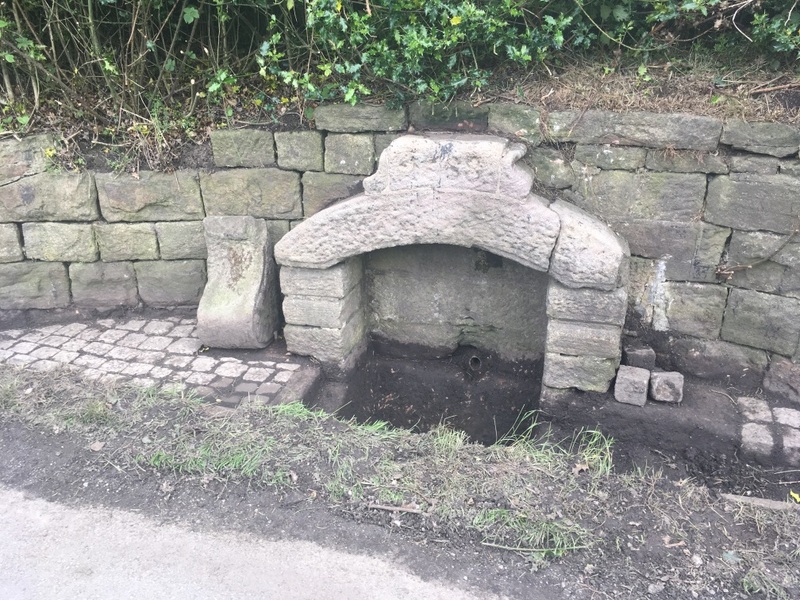 These had been in serious disrepair, however, the Macclesfield Canal Society worked with the BWB to bring them back into production and this work has done much to alleviate the water shortages that were a notable aspect of the canal in dry years. There are most impressive stone aqueducts at Bollington and across the River Dane as well as many high level embankments and deep cuttings. The canal was built to serve the mills, mines and quarries of the Marple, Poynton, Bollington (for cotton), Macclesfield (for silk) and Congleton areas as well as to provide a link from Manchester to the Potteries and Midlands in competition with the Trent & Mersey and Bridgewater route. There are the remains of coal mines in the Poynton and Bollington areas as well as stone quarries on Kerridge Hill, the Cloud and Mow Cop. One of these mills is the Hovis Mill at Macclesfield which has been converted into flats and Mr. Bonson regretted that the owners had unfortunately removed the name from the north end of the building. The Hovis process was patented on the 6th of October 1887 by Richard "Stoney" Smith of Stone. He took his idea to S. Fitton & Sons Ltd who developed the brand, milling the flour and selling it along with Hovis branded baking tins to other bakers. The name was coined in 1890 by London student Herbert Grime in a national competition set by Fitton & Sons to find a trading name for their patent flour which was rich in wheat germ. Grime won £25 when he coined the word from the Latin phrase hominis vis – “the strength of man”. The company became the Hovis Bread Flour Company Limited in 1898. 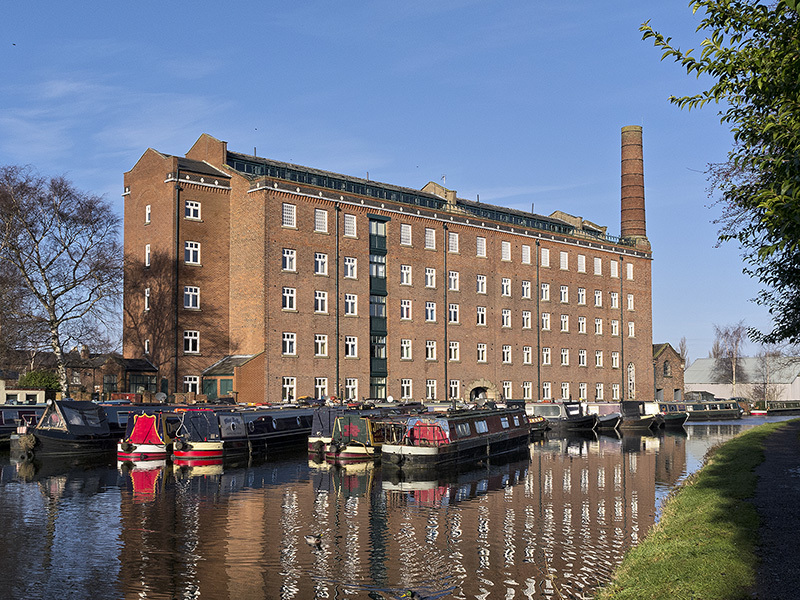 Hovis flour was milled at Macclesfield for only two years but demand out-stripped supply and a new mill was built in Manchester and the “Hovis Mill” was used to store publicity material. The canal is also noted for its fine stone bridges - particularly the six change or snake bridges where the towpath changes sides of the canal. These bridges were designed to allow the horse to move over without having to untie it from the boat. There are most impressive stone aqueducts at Bollington and across the River Dane as well as many high level embankments and deep cuttings. Next Mr. Bonson outlined the work of the Macclesfield Canal Society which grew out of a project to restore the milestones along the whole course of the canal which had been buried during the Second World War to confuse ‘invaders’. All but three stones were dug up and re-erected and they were replaced with new stones cut from Kerridge Hill and then many of the quarter mile stones were also lifted. This project led to the society’s quarterly magazine being called “Milestone”. The next project involved the full restoration of Wood’s Bridge No. 30 between Kerridge and Hurdsfield. Next, Gaw End Bridge No. 47 was restored (an iron and timber swing bridge) just north of Fools Nook. This is the last working example of an original Macclesfield Canal swing bridge when originally there had been about a dozen of them. A new foot bridge, No. 48A, was also installed adjacent to the length man’s cottage between bridge No. 47 and Fools Nook. There have been many other projects including the installation of mooring rings; the painting of original ironwork at the Dane aqueduct; work on the Adelphi Mill in Bollington; and Hagg Farm lattice foot bridge No. 16. Most recently extensive work has been carried out in recent years to re-furbish the railings along the towpath in front of Ramsdell Hall, Scholar Green. An interesting question and answer session followed and Mr. Bonson answered a number of questions about future of the Canal Society and the canals now they are under the control of the Canal and River Trust. Mr. Machin thanked him for an excellent comprehensive look at the Macclesfield Canal. The next meeting of the Society will be on the 19th of June 2017 at 7 p.m. in Biddulph Library when Mrs. Sarah Haydon, Chief Officer for Biddulph Town Council, will present a “Biddulph Town Council Heritage Update”. The April meeting of the Biddulph and District Genealogy and Historical Society was held at 7 p.m. on the 24th in Biddulph Library when Mr. John Berry presented a talk entitled “From Fishing to Flyover - The Story of Norton Bridge”. Mr. Roland Machin introduced Mr Berry and what followed in the next hour was a tour de force of research into a small village in the Parish of Chebsey, near Stafford. Illustrated with over ninety slides this report will try to give an outline of a part of the talk which is recommended to historians, railwaymen and perhaps anglers in equal measure. The township of Cold Norton had a bridge which crossed the River Meece, later the Meece Brook, at Norton Bridge before the river travels south to join the River Sow. It appears on early maps of the area and a reference to Norton Bridge can be found in 1614 in the Stafford Record Office. It is next to Shallowford and it was here after the English Civil War that a Stafford born Royalist, Izaac Walton, fled London and his ironmongery business to buy Halfhead Farm and small cottage with the fishing rights to Meece Brook. When the persecution of Royalists died down Izaak Walton felt it was safe to return to London and published a book ‘The Compleat Angler’ which was to become ‘the’ celebration of the art and spirit of fishing in prose and verse. He left the farm and cottage in trust ‘for the benefit of the poor of Stafford’. The next important event to threaten this rural farming community occurred in 1765 when Richard Whitworth, the MP for Stafford and a local JP proposed a canal to serve the area. Canal mania was at its height and the proposed canal would link the rivers Trent, Mersey and Severn. Although this canal had some advantages, as it did not serve the Potteries there was a lack of support and the rival ”The Grand Trunk“ surveyed by the canal engineer James Brindley was adopted. The Trent and Mersey Canal was enacted by an Act of Parliament in 1766 and the first sod was cut by Josiah Wedgwood in July that year at Middleport. In 1777, the canal was completed, including more than 70 locks and five tunnels, with the company headquarters in Stone. Stafford would be served by the Staffordshire and Worcester Canal. The second mania to follow that for canals was in the 1820’s when ‘railway mania’ began. In 1825 George Stephenson proposed a railway from Birmingham to Birkenhead which would have travelled to the west of Shallowford but failed to get backing. In 1830 he tried again, this time with a railway from Liverpool to Birmingham which was largely surveyed by his assistant, Joseph Locke. Again Stephenson failed to get backing, but a rival proposal agreed to incorporate much of his route, and to appoint Stephenson and Locke as the engineers. The ‘Grand Junction Railway’ linked Birmingham to a junction with the Liverpool and Manchester Railway at Earlestown. Although the plan initially bypassed Stafford this was quickly amended following protests from some of the backers. At Shallowford, the route of the railway followed the Meece but ran to the east of the river as it passed Walton’s cottage, crossing to the west just to the north. This effectively cut the cottage off from the river and lost the fishing rights. Just south of the turnpike road linking Eccleshall with Stone a station was built, taking its name from the adjacent river bridge. Between 1836 and 1840 George Stephenson also surveyed a possible railway linking his ‘Manchester South Union Railway’ to the area; the route would eventually become the North Staffordshire Railway linking Stone to Hammer Houses, adjacent to the proposed Grand Junction. Mr. Berry initially believed Hammer Houses had been named after the Smithy at the end of Smithy Lane where it joined the turnpike but it was, in fact, the home of three sets of Shoemakers and an apprentice which is now a grade 2 listed building. The station at Norton Bridge was to change the local area especially as the various lines joined the original line and made it a major junction. In 1841, the population of the entire Chebsey parish was 400 and no one was recorded as having a railway related job, with all the males classed as either agricultural labourers or farmers. However by 1881, 19 men were listed as having railway related jobs - 7 platelayers, 3 ‘pointsmen’, 2 porters, 2 clerks, and 1 labourer. The census listed 2 Station Masters, a signalman and 1 ‘railway servant’. Almost all were born in Staffordshire with a couple from over the border in Cheshire but, one of the Station Masters came from Leamington Spa, and one porter from Oxford; the ‘railway servant’ came from Marlborough. Before returning to the development of the railways we need briefly to look at what happened to Walton’s Cottage. After Izaak returned to London Walton’s Trustees managed the farm and cottage until the start of the 19th century. As the coming of the railway had changed the area of the property it came under the control of the Stafford County Charity Trustees. It was sold 1920 when a local businessmen bought it and formed the Isaac Walton Cottage Trust. The Trust was wound up in 1965 and the cottage was taken over by Stafford Borough Council. The cottage is now a Walton Museum. 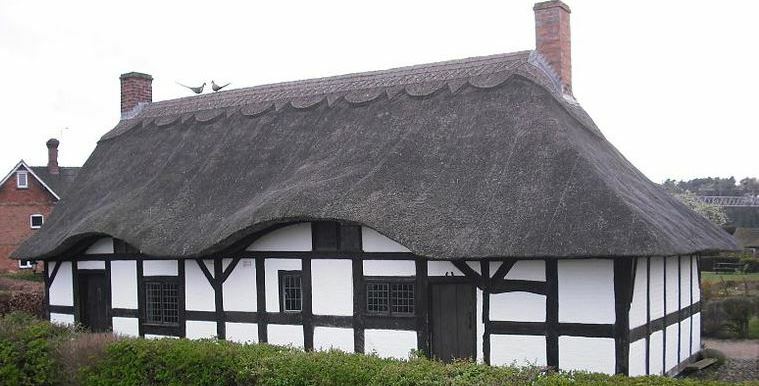 The ground floor of the museum is set-out in period, with information boards covering Walton’s life, his writings and the story of the Izaak Walton Cottage. Upstairs a collection of fishing related items are displayed, while a room is dedicated to his life and the ‘Compleat Angler’. The Izaak Walton Cottage and gardens are open to the public on Sunday afternoons during the summer. Mr. Berry returned to the development of the railway and detailed over a century of changes at Norton Bridge Station under British Rail. Norton Bridge had remained largely unchanged in LMS days and into early BR. In 1955 a modernisation plan led to the electrification of the Manchester and Liverpool to London (Euston). 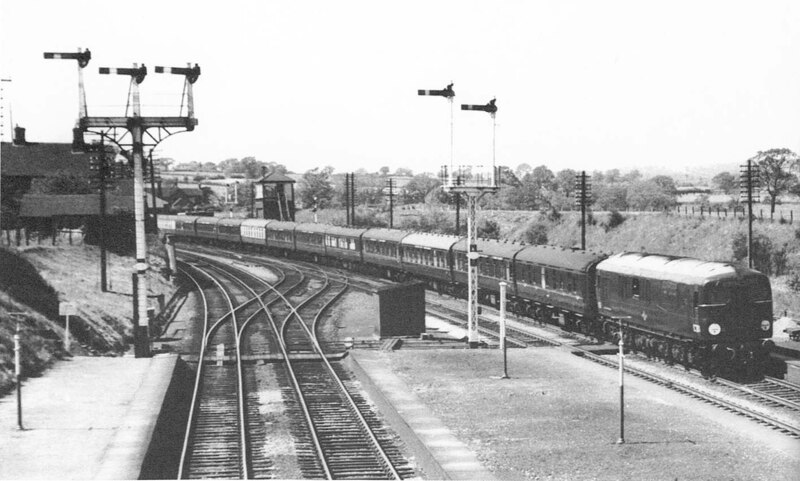 This mid-50s photograph taken from the station footbridge shows the old junction and signal box with an early diesel hauled southbound express. In 1961 the layout and signalling at Norton Bridge was completely revised and a new signal box was built, and the platforms and signals were all demolished. 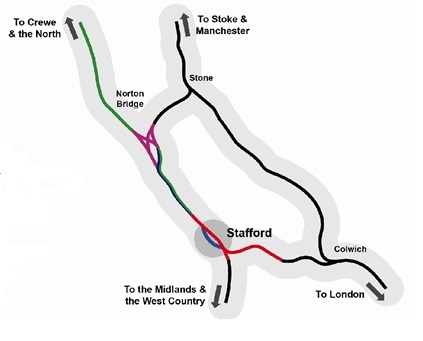 As all the intermediate stations between Stafford and Crewe (apart from Norton Bridge) had been closed it was decided to do away with the two platforms on the west side leaving only the one for local services to Stoke on the east side. The station also moved nearer to its earlier position though the footbridge remained where it was. In the 1980’s the junctions at the south end were converted to a series of crossovers. In 1983 the new chairman of British Rail, Sir Bob Reid, introduced the ideas of business sectors including Inter-City and one major change was that the majority of services from Manchester to the South and the West Country should be routed via Macclesfield and Stoke rather than Crewe. The problem for Norton Bridge was that this now gave three trains per hour in each direction which needed to cross the layout and in so doing block three or four of the main lines. In 2004 major changes occurred at Norton Bridge; the signal box closed; the station footbridge was demolished; the platform was no longer accessible; and so, the train service was then replaced by a bus. In 2010 Network Rail decided to tackle the capacity problem at Norton Bridge by building a new flyover to carry the Stoke lines over the top of the main line. Unlike normal construction contracts, the works were given to a consortium of firms in what is called an ‘Alliance’. This partnership between Network Rail and Atkins, Laing O’Rourke and VolkerRail started work on the project to deliver £250m worth of upgrades on the West Coast main line. This would involve construction of a grade-separated junction, including six miles of new 100mph railway, 10 new bridge structures and two bridge enhancements, a major realignment of the B5026 highway, four river diversions and major environmental mitigation works. The second part of the talk detailed the success of the “Alliance” in completing the work twelve months early - with photographs of the new structures, the work of the on-site archaeologist, the track laying equipment, the new track and then a film of a journey through the new lines, and finally a look at the major buildings in the village of Norton Bridge today. The archaeologist made many finds including Victorian beer bootles but one was a wooden lid (possibly from a butter churn). It was radiocarbon dated to see if it was contemporary with any civil war activity but surprisingly the date came back as AD 715 – 890. This places it squarely in the Saxon period and means it is broadly contemporary with the famous Staffordshire hoard. During this period the area was in the heartland of the kingdom of Mercia and was populated by a pagan tribe called the Pencersaete. 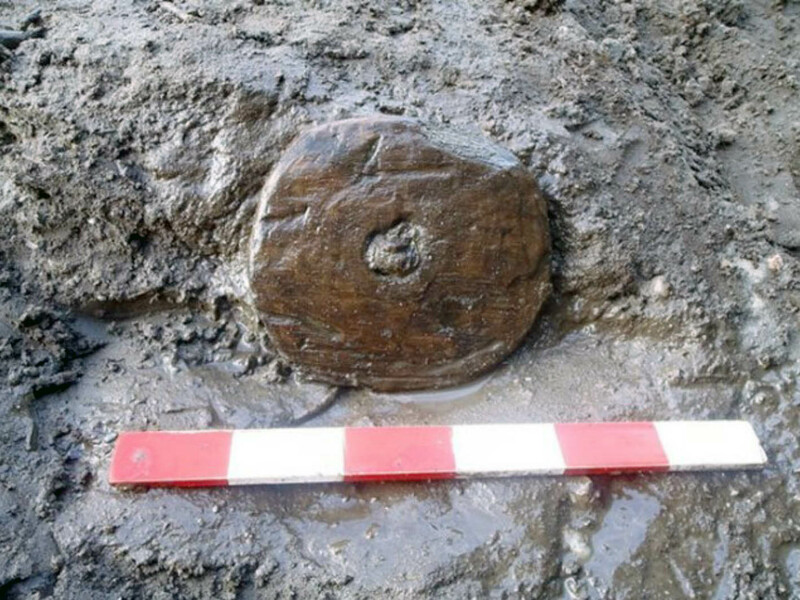 Existing archaeological knowledge of this period for the north and east of the Midlands is scarce and Saxon finds of organic materials such as wood are very rare indeed, so this is a fantastic find, of regional significance. An interesting question and answer session followed and Mr. Berry answered a number of questions about future of the railways. Mr. Machin thanked him for an excellent comprehensive look at the effects of the coming of the railway to Norton Bridge and the extensive engineering work required to update a system which has grown in an ad hoc way since the days of railway mania. The films of the track-laying equipment and Network Rail’s film of the works are available on the Internet. Notices: All three of the most recent publications of the Society: “The Biddulph Grange and Knypersley Sale Document of 1871” edited by David J. Outhwaite; Mr. Michael Turnock’s “Moor to War” and “Brindley Ford” by Mr. Gordon Lomas are all available from Biddulph Library. The BDGHS AGM was held on Monday the 20th of March at 7 p.m. in Biddulph Library. Mr. Roland Machin welcomed the members to the Annual General Meeting and started the evening by presenting the Chairman’s report. He continued “We are most grateful for the regular attendance of so many people and the large number who have committed to membership. The Treasurers report was circulated by the Treasurer, Kath Walton, and this confirmed that the society was in good health and Kath announced that there were to be no changes in the charge for non-members at £2 per meeting and that membership would remain at £5 annually, payable from tonight. The Election of Officers of the Society followed with Derek Wheelhouse being the honorary President. As all the present officials of the committee have expressed their willingness to continue, and as there were no other nominations, Mr. Machin required a proposer and seconder for: Chair Roland Machin, Secretary David Outhwaite and Treasurer Kath Walton and they were duly proposed, seconded and re-elected. Michael Turnock’s book launch “Moor to War” was followed by a break for tea or coffee. This was then a postcard forum and discussion of images from the archive compiled by Elaine and Derek. Some of Mr. George Plant’s photographs were also shown, the slides were well received and engendered lots of audience participation. Computer access to the BDGHS website was supported by Richard Dean and committee members with a display of artefacts / maps etc. Michael Turnock had a table of war memorabilia and Mike Dawson had his customary book stall and some of the BDGHS publications. “So the meeting went very well, with members and visitors finding lots of things to do,” Mr Machin said. 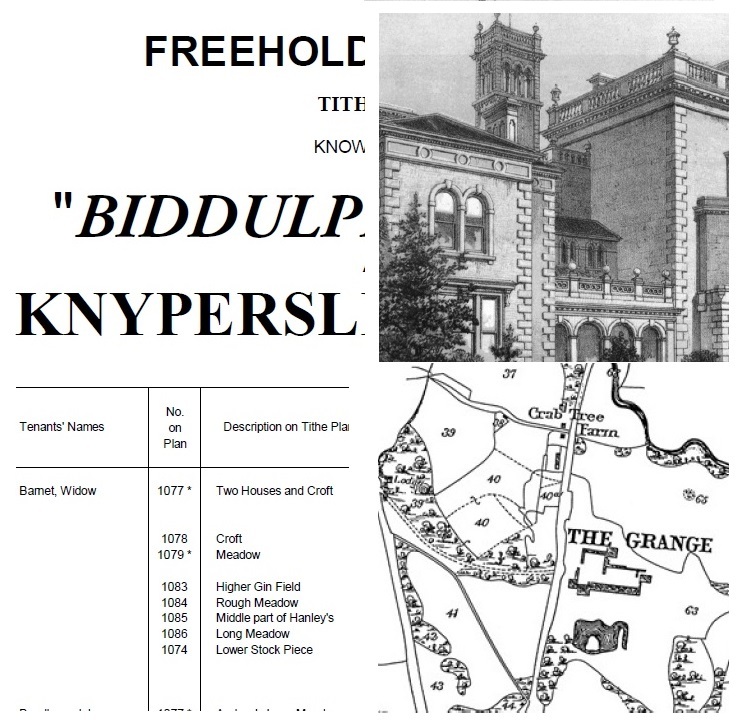 Notices (1) There will be a book launch on Saturday the 22nd of April when the “Biddulph Grange and Knypersley Sale Document of 1871” will go on sale. The book has been produced from an A3 photocopy of the original sale document which was in the possession of Mr. Christopher Slater of Biddulph who gave the Society permission to take a copy. It has been converted to an A4 publication with missing information added from copies at the Staffordshire Record Office (S.R.O.) and William Salt Library in Stafford. When Robert Bateman decided to sell his Estate the sale document included seventeen pages of description of the House and Gardens; six pages of lithograph drawings by Kell Brothers of London of the Biddulph Grange, the Billiard Room, the Italian Garden, China Garden, the ruins of Biddulph Old Hall and the Grounds; fifteen pages of details of the fields, field use and tenants; and eleven pages of Maps of the Estate drawn in 1791. The February meeting of the Biddulph and District Genealogy and Historical Society was held at 7 p.m. on the 20th in Biddulph Library when Mr. Brian Nightingale presented a talk “Protecting Our Paths”. 1. Pavements (including any path along the side of a road) should be used if provided. Where possible, avoid being next to the kerb with your back to the traffic. If you have to step into the road, look both ways first. Always show due care and consideration for others. 2. If there is no pavement, keep to the right-hand side of the road so that you can see oncoming traffic. You should take extra care and be prepared to walk in single file, especially on narrow roads or in poor light keep close to the side of the road. It may be safer to cross the road well before a sharp right-hand bend so that oncoming traffic has a better chance of seeing you. Cross back after the bend. Rule 3 concerns helping other road users to see you, 4 concerns walking with children, 5 concerns walking in groups and the sixth rule concerns motorways and states: Pedestrians MUST NOT walk on motorways or slip roads except in an emergency. 1. 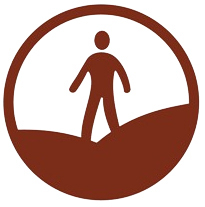 The provision and protection of foot paths and other ways over which the public have a right of way or access on foot, including the prevention of obstruction of public rights of way. 2. The protection and enhancement for the benefit of the public of the beauty of the countryside and other areas by such lawful means as the trustees think fit, including by encouraging the provision, preservation and extension of public access to land on foot. Public rights of way allow the public to walk, or sometimes ride, cycle or drive, along specific routes over land which belongs to someone else – the land itself is often privately owned. When the County Councils were asked to define the rights of way in their area they passed the task down via the District Councils to Parish and Town Councils. Although the process began in the 1950’s some Councils hadn’t responded until the 1990’s. A number of public acts since the National Parks and Access to the Countryside Act 1949 have required that local authorities produce and, subsequently, review maps and statements showing and defining public rights of way in their area – these are known as definitive maps and statements. 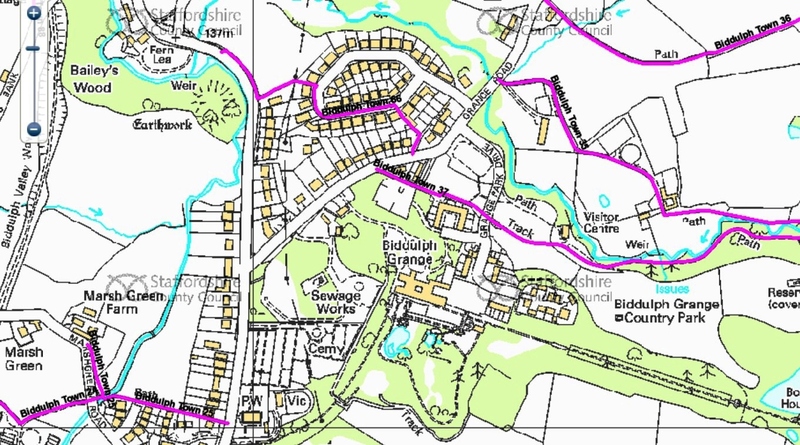 Footpaths, bridleways, byways open to all traffic and restricted byways are distinguished on the maps. Formerly, roads used as public paths were shown too. Local authorities are required to make these resources available for public inspection. Some local archives may also hold old, as well as current, definitive maps and statements. The Biddulph Parish has 156 footpaths of a total length of forty miles and they are to be found on the local definitive maps and they have reference numbers. Nowadays you can find the paths online, at the Staffordshire County Council website and make comments if the path is overgrown. They have a duty to maintain the footpaths. If mistakes were made or a paths route was contested then under powers given in the 1961 Act the revisions can be made – these are designated as 1R (first revision paths). There are now many local Ramblers groups in Biddulph, Congleton and Stoke-on-Trent and all organise walks using these paths which can be best seen on either a Pathfinder Map (2½ inches to the mile) or Explorer maps (6 inches to the mile) where, for example, you will find Biddulph’s No 1 path which runs from Towerhill Road to Stonetrough Farm. As Mr. Nightingale pointed out many of these paths have been here for hundreds, if not thousands of years. Spend any time walking around Mow Cop and you will find a grid of paths from cottages to farms, farms to mills, cottages to Church or Public House, which have been here for years. Another success for the Ramblers was the passing into law of ‘The Right to Roam’ Act known as Countryside and Rights of Way Act 2000. Attempts to achieve a right to roam began in 1884 when James Bryce MP introduced the first Parliamentary bill. The bill was re-introduced every year until 1914 and failed each time. In 1932 six people were sent to jail for leading a mass trespass on Kinder Scout in the Peak District, causing national outcry and bringing the case for a right to roam into the public eye. The campaign suffered a set-back in 1939 with the passage of the Access to Mountains Act but it was later repealed. In 1947 the Hobhouse Committee recommended legislation for public access to open countryside. This led to the National Parks and Access to the Countryside Act 1949. Under this legislation, local authorities were required to survey open countryside, assess the level of access provided to walkers and to secure further access by means of agreements with landowners, by orders or by purchasing the land. In 1985 the Ramblers launched the Forbidden Britain campaign, with the aim of securing a legal right to walk in wild, open areas of countryside without having to stick to paths. Following on from the success of the Forbidden Britain campaign in raising the issue of access to the countryside, the Ramblers began lobbying to give the public a ‘right to roam’. In 1998, Michael Meacher MP, the Environment Minister in a speech to the House of Commons announced his intention to present a Bill. This resulted in the Countryside and Rights of Way Act 2000 (CRoW) became law on 30 November 2000 and walkers won a ‘right to roam’ over wild, open countryside in England and Wales without having to stay on paths. Walkers would, however, have to wait a few more years to enjoy their right to roam. First, maps had to be produced showing where the new right could be exercised. Following a long and complex exercise to identify and map wild, open countryside, the right to roam came into effect across the whole of England and Wales on 31 October 2005. In a series of photographs Mr Nightingale showed examples of good and bad maintenance and his audience enjoyed trying to identify the paths shown. Amongst many stories of local paths, here are just two, the first concerning path 150A and 150B which was split in two when quarrying began in the area. This temporary measure has lasted for fifty years, but has to be resolved by 2036. Secondly, the rambling community has been more successful in reinstating the path from Bosley Cloud to the Bridestones. The leader of the Congleton Ramblers had to present the case to a tribunal to prove that the path previously existed. The evidence included aerial photographs taken by the RAF in 1947 and the memories of Elaine Sweetenham who remembered as a Girl Guide walking the route. This process will become more important as the Government has now set a deadline of 2026 as the date when no more of the “lost paths” can be added to the definitive map. Mr. Nightingale believes there may be 20,000 paths nationally that may be lost if people, especially Ramblers groups, don’t make an effort in the next few years. As part of this process then the maps of the canal and railway builders or the groups that petitioned Parliament to build new routes become more important as they include the names of many paths that crossed the proposed routes. Once a path is included in the definitive map then the Council has to place a footpath sign at each end and provide styles to cross fences and walls. Mr. Nightingale then outlined walker’s rights including the dimensions of paths and stiles that are acceptable. In the case of disputes, he said, for instance a path that passed under a house owners washing line, he hopes that a common sense solutions can be found. An interesting and wide ranging discussion of the state of local paths and the rights and wrongs of land owners and walkers to co-exist followed. Notices: The Book Launch of the re-published book “Brindley Ford” by Mr. Gordon Lomas on Saturday the 18th of February had an excellent turnout. Thanks again to Pam and Gordon Lomas for being there and signing copies of the book. Michael Turnock’s “Moor to War” the story of two Biddulph Moor soldiers in the Great War will be launched at the next meeting of the Society. And that next meeting of the Society will be on the 20th of March 2017 at 7 p.m. in Biddulph Library when Mr. Roland Machin will Chair the Society’s AGM and then a number of activities will be available for members and visitors. Remember the AGM is when you renew your annual membership. The first meeting of 2017 of the Biddulph and District Genealogy and Historical Society was held at 7 p.m. on the 16th of January when Mr. Johnathan Fryer presented a talk “Small Mines in the Biddulph Valley” in Biddulph Library. Mr. Fryer began by explaining that his interest in mining began with Edwin Hancock, his great grandfather, who was born in Congleton in 1846 and died at Dane-in-Shaw in 1931. Edwin Hancock had owned two mines in the valley, the Sands Colliery between 1887 and 1879 and the Mow Cop Colliery between 1897 and 1901. This led to an interest in history, a degree at Durham and a passion for researching the mines of the Biddulph Valley which continues to this day. His talk started by defining the strata of the land of the Biddulph Valley, it being a syncline with folded seams of coal which mainly surface on the western side. The first coal would have been taken by just digging into the near vertical seams for fires. The next stage when more coal began to be required for manufacture would be to develop the footrails which ran into the side of the hill or by digging a small bell pits. The subject of Mr. Fryer’s talk was the commercial exploitation of these sites. The third types of colliery in the valley were the successful shaft collieries that survived almost all to Nationalisation: those at Bradley Green, Brown Lees, Gillow Heath, Harriseahead, Stonetrough and Towerhill. These provided bulk coal for use in the Heath Ironworks or shipping by canal for domestic and industrial use in the Potteries and further afield. So where does the information about the small mines come from? Obviously there are some records and research but it is a time consuming process to produce an accurate picture of a very freelance industry. The following became essential reading, the local papers - the Chronicle and Sentinel; Mines Inspectors Reports which are held in the various Record Offices; Coal Authority plans of mines that have to be paid for; paperwork relating to the 1930 Mines Act, and information held by the North of England Institute of Mining and Mechanical Engineers. The next part of Mr. Fryer’s talk detailed the information which can be gleaned from the accident reports which were published before the 1930 Act. Most small mines had accidents relating to fire damp in the fifty years in which the mines flourished. Usually there had been no problem with fire damp before the accidents, for example, when George Harries died in the Sands Colliery when he kicked over a candle in the shaft. At the Falls Colliery in 1902 a fourteen year old, James Brammer, died of asphyxiation even though they burned straw at the pit entrance to create an air draft. Frederick Harris, a noted tenor in the area, was unusual in that he died in a roof fall in the Mow Cop Colliery. In the main the accidents were few and far between and the owners seemed to be able to argue that they had provided air pipes and that there was little sign of fire damp so that the Coroners rarely record that there had been any negligence. Then Mr. Fryer continued with studies of the small mines including those at the Sands and Woodhouse Collieries. The Woodhouse Colliery mined the Crabtree seam of coal extensively worked between the 1920s up until 1940. The workforce was between 20 to 30 men above and below ground though it peaked at 60 briefly in 1926. The 1930 Act had required much more paperwork and also set quotas for output. It was operated by Abraham Stanway until March 1935 then Fred Lawton came on the scene following closure of Sands Colliery. Stanway had claimed that Lawton tried to push him out. There were constant problems with lack of paperwork submission under Lawton, who claimed letters had been delivered to wrong address or that his wife was ill. It appeared that Lawton couldn’t write as either his wife or a Mr. Alan Machin wrote letters to the Authorities. There were financial problems so much so that Lawton was unable to pay wages in early 1936. Then a gentleman called Casewell promised Lawton he would help with finance and provided a petrol engine but then promptly left. It was obviously hard to make a profit in a seam of coal between 3’ to 3’6” in height and the output varied between thirteen and twenty one tons per week. The big problem was with water, as large amounts entered pit and caused pipes to corrode. Water barrels were used rather than pumping and up to eighty barrels a day were removed, at other times the levels flooded and output was low. Early in 1936 a new footrail in the Crabtree seam was opened but by April it was abandoned. A second colliery Woodhouse No. 2 was opened but water problems persisted and in early 1937 it was only extracting enough coal to meet the needs of its boiler. The colliery was taken over by Robert Hall in 1937, but stopped producing coal in 1940 and show all the problems of running a small mine on the side of the Biddulph Valley. Mr. Fryer, after extensive research has identified 29 small mines in the Biddulph Valley for which some records exist. They were working coal between 1889 and 1941 but in no case consistently for the whole period. There may well have been others but they probably preceded 1889 and are unrecorded or lasted for only a short period as a footrail. Of the ones recorded on average they employed up to 10 men, working both underground and over ground, with an average peak workforce of 15 men. The figures are skewed by the three ‘larger’ small mines which were Woodhouse with a peak of 60 workers, Newbold with 40 and Mow Cop with 30. The mines in alphabetical order are: Ballbrook, Beacon House, Biddulph Road, East Ballbrook, Falls, Forward (x2), Gillow Heath, Hinds Wood, Hurst Bank, Long Edge, Moody Street, Mow Cop (x3), Newbold, North Midland, Over Biddulph, Sands (x3), Sands Footrail, Station, Tower Hill, Vicarage (x2), White Star, Winpenny, and Woodhouse (x2). It should be noted that confusingly some mines also changed names seemingly at the whim of the owners. 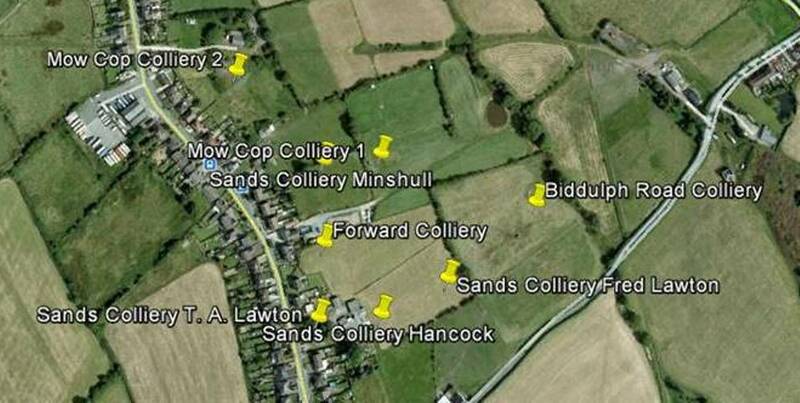 The map above shows the mines and footrails that could be found along Sands Road below Mow Cop. It is a part of the many maps and photographs shown in the talk which identified the mines. This map is included here as it leads on to the final part of Mr. Fryer’s talk which was about his relative Mr. Edwin Hancock who owned a couple of these mines. Edwin was self-taught and started to work in silk mill looking after the engines. In 1867 he married Hannah Jones, daughter of small-scale silk owner. They moved to Mow Cop when Edwin worked as winding engineman at Stonetrough and his wife ran a grocer’s shop. They had three children but tragically they died of scarlet fever in 1875. Stonetrough Colliery closed in 1887 Edwin in partnership with a Mr. Hulme they opened Sands Colliery. However in 1889 the following notice appeared in the local press. Excellent weighing-machine (quite new), portable engine and drum, with wire rope, wood engine-house, with corrugated iron roof; ditto cabin, large oil lamp, cask of oil, steel drills. 70 yards of pit chains, 22 Iron water-pipes, four yards long; 4 iron bars, sixteen feet long; 30 cwt. of pit rails, iron rakes, hammers, wrenches, iron stand, old fan, iron pump, 3 jammers, 3 old barrows, wood bed at top of pit, timber lining at top of dip, lot of old timber, old iron, $c. Sale to commence at One o’clock. Auction Office: 64, Heathcote-street, Kidsgrove. In 1897 he bought Mow Cop Colliery which had had two previous owners since 1894 which shows it was not unusual for small mines to often change hands and suggests it was hard to make profits. The Mow Cop mine employed up to sixteen workers and was sold in 1901. It continued to work until 1917 being owned by the Mould brothers. In conclusion Mr. Fryer explained that although the small mines of the Biddulph Valley only ever employed up to 100 at any one time they made a constant contribution to the local economy. An excellent question and answer followed when facts were exchanged and anecdotes traded. Mr. Roland Machin then thanked Jonathan for an excellent, well-researched and balanced talk which the audience had thoroughly enjoyed. The next meeting of the Society will be on the 20th of February 2017 when Mr. Brian Nightingale will talk on “Protecting Our Paths”.